Hello there, today I have another card to share using a wonderful stamp set from Tracey Hey and Alpaca Pals. This time I am using the adorable Hey Cutie set. I started off by stamping the elephant on to white cardstock with Memento Tuxedo Black Ink. I coloured her using Copic Markers (the colours I used are listed below the supplies section) and fussy cut her out with scissors. I stamped the sentiment on to black cardstock with Versamark Ink and applied white embossing powder and heat set. These were then cut in to strips. When I made this card, I created a couple of extra backgrounds so I thought it would be good to use for this card. The background was made by embossing the SSS Stained Glass 1 Stencil and adding Dr. Ph. Martin's Radiant Watercolours on top. The background piece was then die cut using a SSS Stitched Rectangle Die and then adhered to a white 4.5" x 4.5" card base with foam sheet and DST. I added the elephant and sentiments on top with thin foam squares. To finish off, I added Aqua Shimmer Pen and Crystal Glaze to the heart on her top. COPIC MARKERS: Elephant - W7, W5, W3, W1. Top - V28, V25, V15, V12, V01, B04, B02, B000. I had so much fun using these stamps from Alpaca Pals that Tracey has kindly provided me with three stamps sets for me to giveaway, so that you can enjoy them too. The sets I am giving away are the three that I used this week - Koality, Hey Cutie and Make A Splash. All you have to do to enter the giveaway is to leave me a comment on this post telling me what your favourite animal is. The giveaway closes on 26th July 2018 at 23.59hrs BST. The winner will be announced here on my blog on the 27th July 2018. Good luck! For more inspiration using the Alpaca Pals stamps, please head over to Tracey's website and Facebook page. Thank you so much for stopping by to see me today. I hope you have a great rest of the weekend! Lovely cards & wonderful giveaway!!! Sloth is my favorite animal! Love the coloring and the background. Michele your fussy cutting always amazes me. Thanks so much for the chance to win. Take care. Hi Michelle fabulous cards. Love Alpaca Pals by Tracey Hay stamps. Have several sets. The animal I love is the delicate, mysterious seahorse. always makes a cute card! My favorite animal is my dog! But in the wild I love watching the giraffes! And any sea animal is amazing since I am in a land locked state the sea and all it offers is amazing to me. I love these sets and can't decide which I like best! Probably the sea one. Thanks for the opportunity to win! Your card is adorable ! This little girl is so cute with her bow and her t-shirt. I love the colors too (blue is my color...). Thank you so much for the giveaway, it's really generous from Tracey to offer these stamps set. 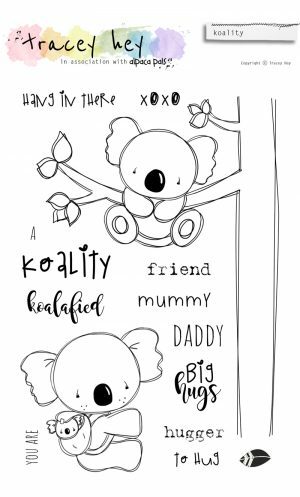 My favorite animal is the koala, but it's not been an easy choice, they are all so lovely !!! Gorgeously cute lil elephant. 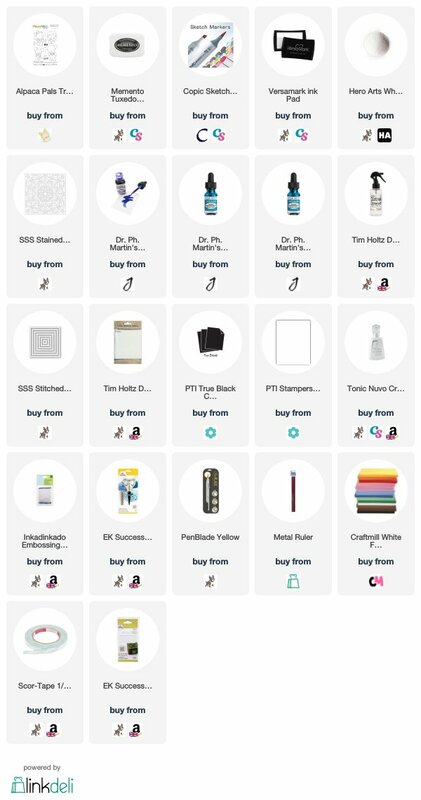 As soon as I saw the first card from you with koala I was hooked & had to go see all of Traceys site & make a list of which sets I need in order lol. 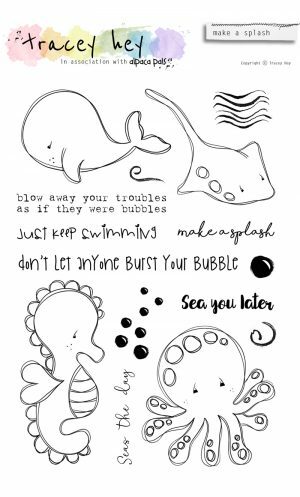 My favourite animal is a seahorse if I can call it an animal, if I can't then it's my favourite creature followed by cats, dogs, bears. I like sea life ... beautiful bright fishes. Adorable Card!!! My favorite animal is a toss up.. I adore parrots and dogs! I don't have a bird right now, but I have many dogs! My fave animals are elephants and giraffes. Your card is so sweet, love the background! My fav animals are horses. We raised quarter horses when I was a teenager and I have so many happy memories of that time in my life. Thanks for another great post. I also love your videos! Not only your card making videos but the haul videos as well! Love your cute card Michelle. My favourite Amin all has to be a cat. I recently found your blog. Love your style. My favorite animal is a Chickadee. So sweet! Love the elephants. Your creations are always so inspiring! Thank you for sharing and for this lovely giveaway! Love this card and these stamp sets so much. My favorite animal is a lion, such majestic animals! My favourite animal is a Snowy Owl. I love how majestic they are. ADORABLE CARD MICHELLE! The colors that you blended together are so FANTASTIC! and that Elephant what a cutie to look at too! My favorite animal would have to be Cats! We have 2 cats! One is a Calico named Maggie and the other one is a Gorgeous Russian Blue named Star! Adorable card! I love the background! My favorite animal is a pig. They are just so adorable!! Hi Michelle, as I've only ever had cats, they'd have to be my favourite animal. However... will craft with anything cute and fluffy! 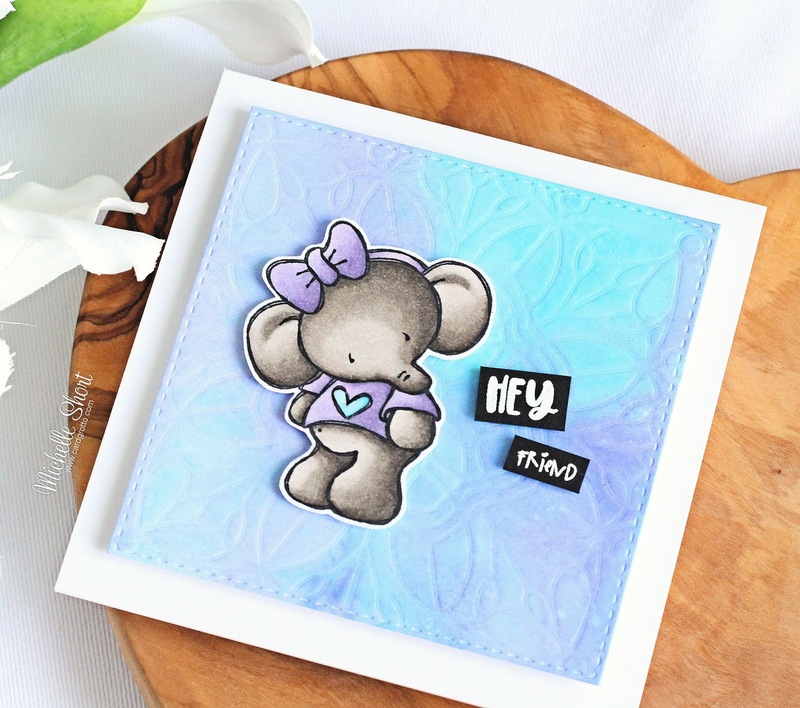 These Tracey Hey stamps are lovely and the background you've created sets the design off perfectly. I feel 'fairly sure' that I shall be investing in some alcohol inks soon!!! I love pretty much all baby animals. My favorite would have to be cats though. 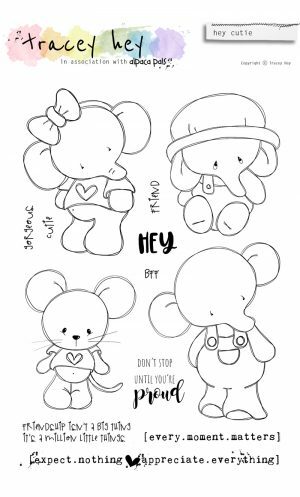 These stamp sets are really cute. Thanks for the giveaway and for sharing another great card. It isn't very often I post a comment but I really enjoy your work. Hi Michelle. Fabulous card as always. Such a cute elephant and gorgeous stamps. Having just come back from holiday, my favourite animal I have to say at the moment is the turtle, but love the stingray (so elegant and beautiful) and the seahorse. I hadn't heard of this company (where have I been), but the stamps look amazing and are already on my wish list. platypus is my favorite animal. But this elephant is really adorable! !